IMAX has unveiled a trailer for Pacific Rim Uprising, which showcases all-new action scenes between the new Jaeger robots and the kaiju beasts that threaten the Earth's well-being. This trailer also helps illustrate the scope of the massive new kaiju creature, which dwarfs even these huge Jaeger robots, and shows that if these new pilot want to ensure Earth's survival and safety, they have to work together as a team. This exciting trailer also presents a compelling case as to why this movie should be seen in the IMAX format, putting some of the biggest action set pieces on display. The trailer also offers a few new scenes with a few of the returning characters from the original Pacific Rim, Mako Mori (Rinko Kikuchi) and Newton Geisler (Charlie Day). 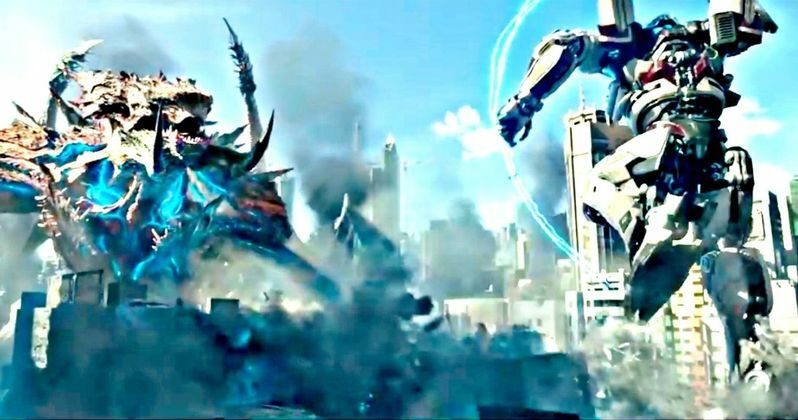 While we've seen the new Kaiju threat in previous trailers, there is a scene in this trailer that literally shows this monster dwarfing the Jaegers, with Scott Eastwood's Nate Lambert noting, "Well, he's pretty big." The strength of this kaiju is also put on display, tossing one of the enormous Jaegers like it was a rag doll, but this team of scrappy pilots aren't out of the fight quite yet. John Boyega (Star Wars: The Force Awakens) leads this cast as the rebellious Jake Pentecost, a once-promising Jaeger pilot whose legendary father gave his life to secure humanity's victory against the monstrous "Kaiju." Jake has since abandoned his training only to become caught up in a criminal underworld. But when an even more unstoppable threat is unleashed to tear through our cities and bring the world to its knees, he is given one last chance to live up to his father's legacy by his estranged sister, Mako Mori (Rinko Kikuchi), who is leading a brave new generation of pilots that have grown up in the shadow of war. As they seek justice for the fallen, their only hope is to unite together in a global uprising against the forces of extinction. Jake is joined by gifted rival pilot Lambert (The Fate of the Furious' Scott Eastwood) and 15-year-old Jaeger hacker Amara (newcomer Cailee Spaeny), as the heroes of the PPDC become the only family he has left. Rising up to become the most powerful defense force to ever walk the earth, they will set course for a spectacular all-new adventure on a towering scale. The globe-spanning conflict between otherworldly monsters of mass destruction and the human-piloted super-machines built to vanquish them was only a prelude to the all-out assault on humanity in Pacific Rim Uprising. The cast of Pacific Rim Uprising also includes Jing Tian, Burn Gorman, Adria Arjona and Nick Tarabay, with Steven S. DeKnight directing from a script by T.S. Knowlin, Kira Snyder and Emily Carmichael, based on characters created by original Pacific Rim writer Travis Beacham. Early box office projections put Pacific Rim Uprising earning roughly half of what its predecessor made, taking in $20 million in its opening weekend with just $49 million domestic. Regardless, the international tally will be the most interesting to watch, particularly its reception in China. Take a look at this new trailer, courtesy of IMAX YouTube.